There are bunch of films made about people who suffer from amnesia, or being taken advantage of due to their memory loss and being kept hostage without even their knowledge. One of those films we have recently seen is Before I Go To Sleep with Nicole Kidman and Colin Firth. Amnesiac, directed by Michael Polish, may not have an Oscar-winning cast in his recent film, but that does not mean it deserves less attention despite receiving only bad reviews. It’s not that I am here to write another negative review, but rather be fair and as objective as possible. After all, it’s not that bad a film as you may have heard, otherwise I would simply skip it as I usually do with many other films, which does not inspire me enough to write a single line. 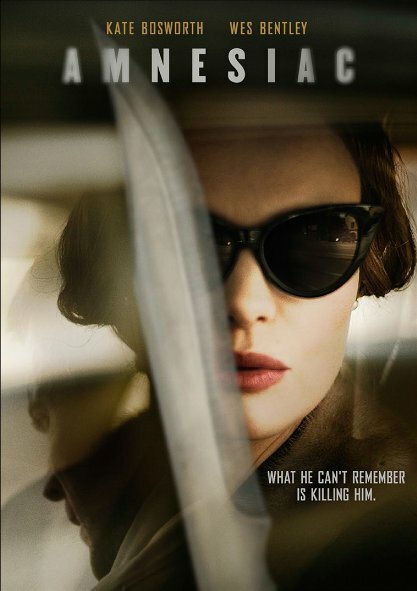 Amnesiac follows a man (Wes Bentley) who wakes up in bed suffering from memory loss after being in a car accident. He finds himself being taken care of by a woman, who introduces herself as his wife (Kate Bosworth). Being helpless and remembering nothing, the man at first believes her and asks her to help him get his memory back. But after sometime, he begins to suspect that his wife may not be his real wife and everything she tells is pure lie. But by the time he realizes that it’s too dangerous to escape, too dangerous to make an attempt to plea for help from outside. It’s because every time someone gets close to her house – lose their life. As the film unfolds, through the flashbacks or man’s dream, you see a little girl who was in the passenger seat during the accident. Despite the wife being so kind, our hero tries to connect the dots and find out who that girl was in the car, but an unconvincing answer he receives from the woman does not help him go further but rather raises his suspicion. And soon, after a little tour he made around the house, he finds the terrifying truth about the woman. And by that time it will be too late to do anything to help himself…. Amnesiac is one of those films where most of the viewers can tell, “it could have been much better.” But honestly, this movie can’t get better or worse with the plot it had. Filmmaker’s aim is to target a certain audience who would enjoy watching a dramatic horror film, but not too scary to scream. This movie does not offer, fortunately, too much blood with horrifying murder scenes. It mostly concentrates on characters and the way they act, and that is all what matters when it comes to filmmaking. Certainly, this film has many issues to talk about, but all those negativities won’t ruin your impression or leave you disappointed in the end. Rather having something to decide for you, why don’t you watch it yourself and decide if you agree or disagree with the above statements?